On this page your will find examples of work which falls outside our normal production runs and has been undertaken at a customers special request. These jobs consist of repair, restoration and conversions to existing items or the manufacture of items to special order. Loco fitted with new finescale wheels. A customer contacted us and asked if it would be possible to change the wheels fitted to his loco for a more up to date finescale set. The reason was that the original wheels that the model comes with would not run over the Peco point work that he was running the model on. On looking at the model, it would have seemed to have been supplied with 'O' Gauge coarse scale wheels and the back to back setting also seemed to be under size. This caused it the jump when running over both check rails and point 'frogs'. 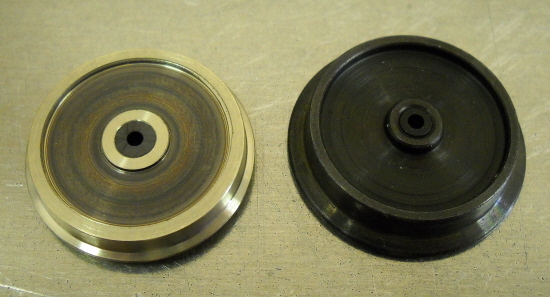 The next two photos below shown the difference between the new finescale wheels and the original coarse scale versions. New and original wheels side by side. When we removed the base from the bogies, we found that the drive train was made up of a worm and wheel drive and clutch to one axle and a toothed belt drive to the other. We therefore desided that the best option was to just remove the original wheels from the axles and fit new finescale wheels in their place. New finescale wheels fitted into loco. A customer who runs a number of the new Hornby Live Steam Locomotives, contacted us over a problem he had, where the heat generated by the model was melting two of the gears used for timing the value gear and asked if it be possible for us to manufacture for him two replacement gears in Brass. The reason, was that the original Hornby gears used for part of the value timimg assembly were made of injection moulded plastic and these had started to melt from the heat generated by the model when in use. 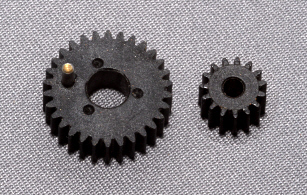 Below are examples of the original Hornby gears as new and after exposure to heat from the model when in use. 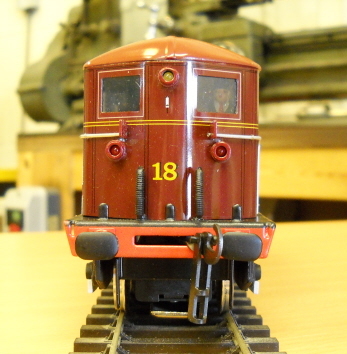 Hornby gears as fitted to new model. Hornby gears damaged by exposure to heat from model. He then supplied the above examples to take the necessary dimensions from so we could manufacture new replacement Brass gears. He also asked if we would make a bossed version with grub screw fixing of the smaller of the two gears and this we did. 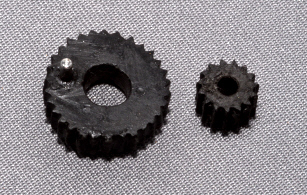 The new gears are shown below, including timing pin in the larger of the two gears. Ultrascale's new replacement Brass gears. The new gears were then sent to the customer for testing. The new new gears can be seen fitted in place on the timing assembly below. Timing assembly showing Ultrascale's new Brass gears in place. The following has been included in this section as we think some modellers my find it of interest. It concerns the conversion of a customers locomotive chassis from 'OO' to E.M., Now you may think, so what! Well there were two problems with this particular conversion. 1. The locomotive had inside value gear so the axle could not be removed and replaced. and 2. These axles were Romford 'OO' gauge axles. As shown below in Fig. 1 the solution was simple, fit Ultrascale wheels to the 'OO' gauge Romford axles and at the same time changing the gauge to E.M. 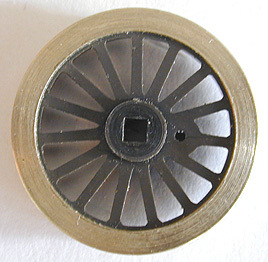 This conversion was done by manufacturing a new core pin to take the square end on the Romford axle (see fig. 2) and at the same time making the recess in the front of the wheel to let the wheel securing nut come flush with the front of the wheel boss. (see fig. 3) The timing of the square hole within the wheel did not matter as long as all the required wheels were moulded with the new core pin in the same position. Next came the problem with the gauge. This was solved by leaving the boss on the back of the wheel longer by half the amount required to take up the difference between the 'OO' and the E.M. gauges. By doing this the wheels were spaced out on the original 'OO' gauge Romford axles to the new back to back gauge for E.M., The wheels were then fitted to the axles like any standard Romford wheel. Once all the wheels, connecting rods, etc were re-assembled on the chassis. The Locomotive was test run on the customers E.M. layout were it performed without any problems. 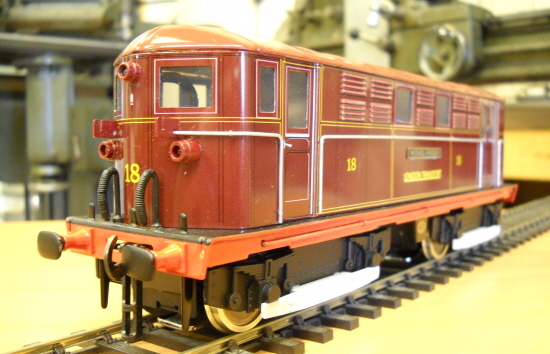 A customer asked if it would be possible to convert an Athearn motor bogie he had to 18.83 gauge and at the same time fit 3' 6" (14mm) disc diesel wheels to it. The following is a brief description of the work undertaken on the bogie. The above pictures show the completed bogie and the new 18.83 wheel sets. 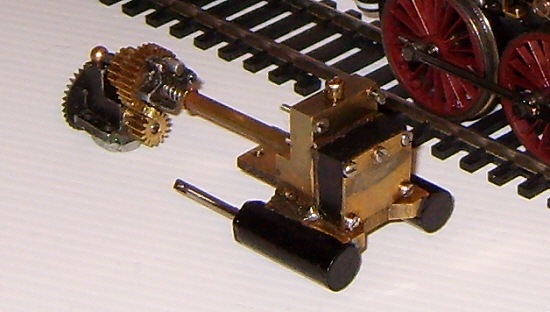 The Athearn motor bogie has all wheel pick-up through a split axle arrangement and drives on all axles. Each wheel set is constructed with a plastic gear/insulating muff, into which each side a wheel and stub axle are fitted. Electrical pick-up is via a square phosphor-bronze bearing on each stub axle, just behind the wheel. First, six new 3' 6" (14mm) disc diesel wheels had to be manufactured. 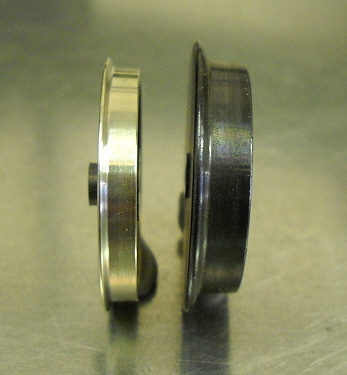 These wheels were some of our special earthing type wheels which automatically connect electrically to the axle when assembled on it. Then six new 3/32" dia. stub axles were then manufactured, these were made longer than the original ones to allow for the gauge widening to 18.83. The wheels and stub axles were then assembled and check to make sure that there was an electrical connection between the wheel and the stub axle. 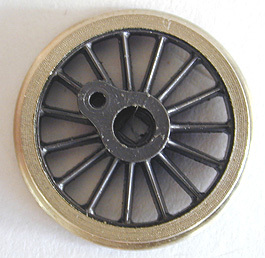 Next the original wheel sets were dis-assembled retaining only the square bearings and plastic gears. The bearings were then fitted to the new wheel/stub axle assemblies and these were then fitted into the plastic gear/insulating muff and checked for correct gauge. The new wheel sets were then fitted back into the bogie to complete the conversion. In response to our advert in the 'O' Gauge Guild Gazette, we were contacted and asked if we could help with gears for a Bassett-Lowke motor bogie. The bogie was sent to us for appraisal and after giving it the once over, it was obvious it was more than just gears which were needed. Fig. 1 shows the condition of the original gears on the motor bogie. Fig. 2 shows one of the new replacement gears. The years had taken their toll, in the end all bushes in the chassis were replaced, new spindles for the gears were made and fitted together with new axles. All new gears were made and fitted, with the exception of the primary drive from the motor which was a pinion and contrate gear set. These were in remarkably good condition considering the age of the motor bogie which must have be all of 40 years. 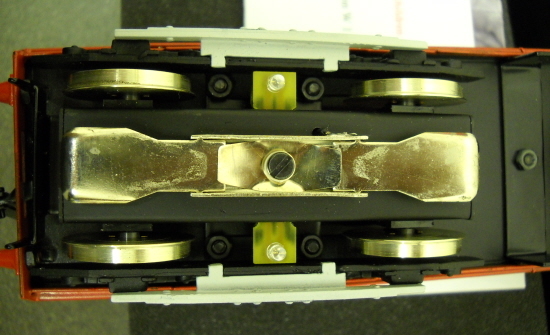 Fig 3 shows the bogie with new gears, axles and bushes fitted. Suffice to say the reconditioned motor bogie now runs very nicely and hopefully will give more years good service.